CONFESSION: We took a night off Superfit to enjoy the Jax Foodie Tour experience and WOW – an experience it was! No better way to spend a rainy Wednesday night than over a warm bowl of craft ramen (shout out to @CraneRamen) and good company. Thanks for the great pic, Corinna! We don’t always veer from our delicious Superfit meals, but when we do we make sure it’s #foodie approved. The Jax Foodie Tour is an exclusive 2-week Jacksonville food marathon. With your own foodie pass, you can enjoy access to all participating restaurants! Each restaurant serves up a 3-course secret menu. That’s why we decided to crash Wednesday’s foodie tour at Crane Ramen, a craft ramen restaurant located in historic Five-Points of Jacksonville. They offered a variety of set menus that included appetizers, an entree and dessert. 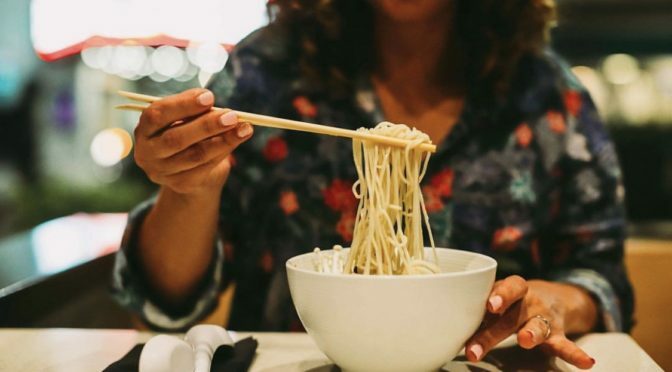 From pan-fried pork dumplings to a warm, savory bowl of craft ramen, you could say we were in foodie heaven. Despite the delicious, exclusive food access, the tour was a unique way of meeting other Jax locals who share a true passion for food. It’s sponsored by two local foodies who you can surely trust for #foodie approval (GratSee and NateDoesFood). And although ramen was quite the stray away from our typical Superfit meals, the Jax Foodie Tour offers healthier restaurant options, too! Many of which cater to vegan and vegetarian diets as well. Food aside, restaurant service makes all the difference. Crane Ramen went above and beyond, making sure we were enjoying our experience! The primary reason we did the Jax Foodie Tour: THE FOOD, DUH! I think eating from a secret menu made it taste even better, too 😉(if that’s even possible). An innovative way of bringing local foodies together to celebrate the hottest Jax food spots! So unique! If you like good food and cool people, you must check this out! Memories are often created around food. Our vision at Superfit Foods is to make clean eating cool. In turn, we encourage others to continue creating those memories, but around delicious, healthy food. We think it’s awesome the Jax Foodie Tour created an innovative experience to bring like-minded individuals together for an even bigger purpose.